Jordi Gomez's stoppage-time free-kick clinched victory for Blackburn Rovers in a seesaw game with MK Dons. Samir Carruthers put the visitors ahead with a curling left-foot shot, but Gomez headed Rovers level with the first of his double following a corner. Elliott Bennett's low drive put the hosts in front for the first time, only for Alex Revell to square matters, slotting in Josh Murphy's cross. Rovers won it as Gomez curled superbly over the wall to beat Cody Cropper. It was a heartbreaking finale for Karl Robinson's side, whose relegation worries deepen after the side immediately below them in the Championship table, Rotherham, were 2-1 winners over Brentford. For Blackburn, it was a second consecutive home league victory that lifted them to 18th after Fulham were beaten at Middlesbrough. Rovers were booed off at the break, but their second-half performance was much improved, with goalkeeper Jason Steele needing to tip Jake Forster-Caskey's free-kick on to the bar before Carruthers' opener. Even so, after a Dons revival that saw Dean Bowditch shoot into the side-netting and substitute Revell equalise, it needed a moment of magic from Spanish former Sunderland midfielder Gomez to seal just a fifth home league success of the season for Paul Lambert's men. "Jordi Gomez, as I said before, has been terrific. Jordi plays the game as if it's really natural to him - all top players do that. "He's technically excellent on the ball. Even his first goal was a brilliant header. The second goal was genuine world class. We're thankful that Sunderland have let him come (on loan). "I am delighted obviously with the win. First half, we were nowhere near it. I expect better and demand better. Second half, yes. "I know how players react and how they think and sometimes you can see what is going to happen but your legs don't carry you because you feel tired from the game. "It wasn't until the second half when we got them in, changed the system, got more bodies around the ball and started to dominate the middle of the pitch." "I thought we were excellent in our performance levels. We showed we move the ball really well but we work hard as well in and out of possession. "Today what's cost us is schoolboy-error defending from a set-piece and they need to eradicate that themselves and need to learn their lessons. "It's gut-wrenching as a manager when we're sat here with nothing. "I think we've been robbed, and that's not being disrespectful to Blackburn Rovers. Everybody knows the respect I have for this football club, but I'm gutted." Match ends, Blackburn Rovers 3, MK Dons 2. Second Half ends, Blackburn Rovers 3, MK Dons 2. Darragh Lenihan (Blackburn Rovers) is shown the yellow card. Goal! 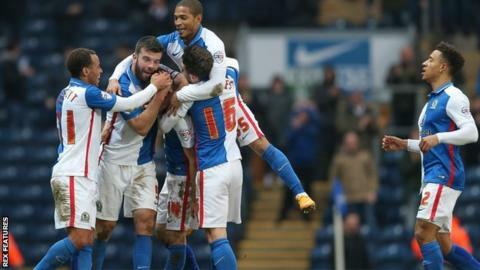 Blackburn Rovers 3, MK Dons 2. Jordi Gómez (Blackburn Rovers) from a free kick with a left footed shot to the bottom left corner. Attempt missed. Shane Duffy (Blackburn Rovers) header from the centre of the box is high and wide to the right. Assisted by Thomas Spurr. Attempt blocked. Danny Graham (Blackburn Rovers) right footed shot from the centre of the box is blocked. Goal! Blackburn Rovers 2, MK Dons 2. Alex Revell (MK Dons) right footed shot from the left side of the box to the bottom right corner. Assisted by Josh Murphy. Attempt missed. Dean Lewington (MK Dons) left footed shot from the right side of the box is too high. Assisted by Joe Walsh following a corner. Corner, MK Dons. Conceded by Grant Hanley. Attempt blocked. George Baldock (MK Dons) right footed shot from outside the box is blocked. Assisted by Josh Murphy. Substitution, MK Dons. Robert Hall replaces Samir Carruthers. Corner, Blackburn Rovers. Conceded by George Baldock. Substitution, Blackburn Rovers. Adam Henley replaces Ben Marshall because of an injury. Attempt missed. Dean Bowditch (MK Dons) right footed shot from the right side of the box is close, but misses to the right. Assisted by Samir Carruthers. Goal! Blackburn Rovers 2, MK Dons 1. Elliott Bennett (Blackburn Rovers) right footed shot from the centre of the box to the bottom right corner. Attempt missed. Shane Duffy (Blackburn Rovers) header from the left side of the six yard box is high and wide to the right. Assisted by Elliott Bennett with a cross following a set piece situation. Foul by Jake Forster-Caskey (MK Dons). Attempt missed. Shane Duffy (Blackburn Rovers) header from the centre of the box misses to the left. Assisted by Elliott Bennett with a cross following a corner. Corner, Blackburn Rovers. Conceded by Cody Cropper. Simeon Jackson (Blackburn Rovers) wins a free kick on the left wing. Offside, MK Dons. Darren Potter tries a through ball, but Nicky Maynard is caught offside. Attempt missed. Nicky Maynard (MK Dons) right footed shot from outside the box is high and wide to the right. Attempt blocked. Josh Murphy (MK Dons) right footed shot from the left side of the box is blocked. Substitution, MK Dons. Josh Murphy replaces Jonathan Williams. Substitution, Blackburn Rovers. Simeon Jackson replaces Chris Brown.